Most doom metal uses outsized musical gestures to express outsized ideas. Those slow, plodding chords in "Iron Man" are the indomitable steps of the title character; My Dying Bride's elegiac power chords represent the decay of the soul; the sparsely planted, monolithic guitar slabs on a Monarch! record are freshly erected tombstones for happiness. 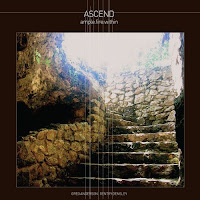 So what to make of the debut by Ascend, a collaboration between Southern Lord founder Greg Anderson (Sunn0))), Goatsnake, Thorr's Hammer, etc.) and his old pal Gentry Densley of Salt Lake City's Iceburn Collective? Doomy Melvins tropes are present in the processional majesty of "The Obelisk Of Kolob," which makes the case for the trombone as a necessary intensifier of heaviness. Towering riffs crumble on the awesome title track too. And yet Ample Fire Within is not content to bludgeon its way into our crania like so much doom -- it's far more patient than that, even wiser. It's weird to think of music as feeling (as opposed to sounding) old, but Ascend does just that. "Divine" is a field recording from a cave that's been uninhabited for billions of years, almost pulseless, free of momentum, with liquid guitars and electric piano commingling in brackish pools. Densley slurs and growls his words (" Who should come to claim the throne/But king of carrion, the crow/His darkness grows/As he licks the skeletons white and gleam") with subterranean glee. The oldness continues on "V.O.G.," a plodding ritual waltz of fuzz bass, pagan drumming and lysergic guitar leads, courtesy of Void's Bubba Dupree and Soundgarden's Kim Thayil. Ten-plus minutes of stoned supplication, all Tuvan drone and dehydrated un-riffing. Densley chants "God only knows how we made it this far/Everybody knows/We must be monsters, too" in a monastic drawl, and there's acceptance in that line. The vibe is post-ominous. It's a hymn to the monster inside. It's a knowing pun, that album title, 'cuz there's a smoldering yet "Ample Fire" to this album but also an "Amplifier" that's turned inwards as often as it blasts outwards. Anderson and Densley value the interstices between their doom outbreaks just as much as the guitar thunder itself, if not more so, and guest Ascenders Steve Moore (trombone, wurlitzer, organ) and Andy Patterson (drums) help 'em fill in the gaps with atmosphere that veers from Earth-y twang to the spacey abstractions of 70s prog. There's mystery to Ample Fire Within, a quality that ya don't often get from the primally powerful but often didactic doom metal genre. Hear samples of Ample Fire Within on Ascend's MySpace page.